OUR TRUNKS have spent many years on the road. Some have been showing for thirty years. They have been to World Cups, Olympics, Indoors, Florida and horse shows across the country. 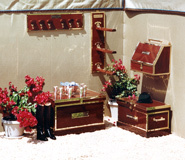 They can be made in vinyl or a variety of special woods trimmed in mirror finish stainless steel, brass or wood edging. We suggest that you contact Katrina Coldren, The Clothes Horse, for your covers, horse clothing and tack room drapes. From time to time we confuse ourselves with all the choices of styles, trims and materials. Consequently we are sympathetic if you do not find all the options completely clear. Please call us and let us try to help. 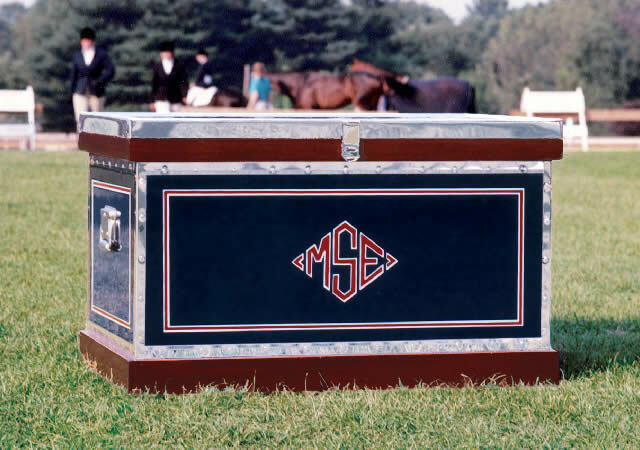 This large vinyl trunk has a vinyl top, stained and varnished hardwood and is trimmed in mirror finish stainless steel. 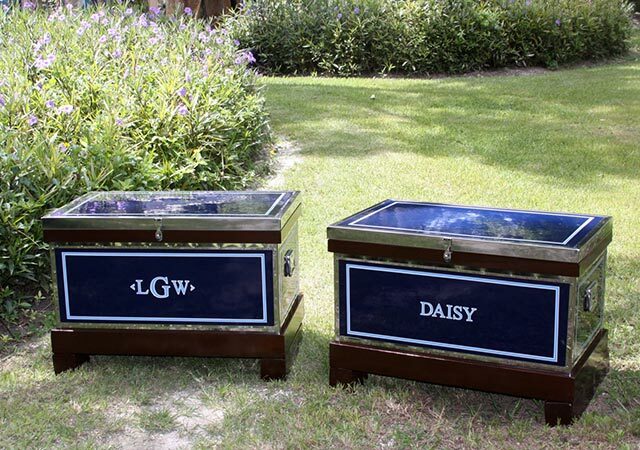 The pinstripe and diamond monogram, which are piped in a third color, are engraved into the vinyl. All the Large Trunks are 36" long. 24" from front to back and 23-1/2" tall. 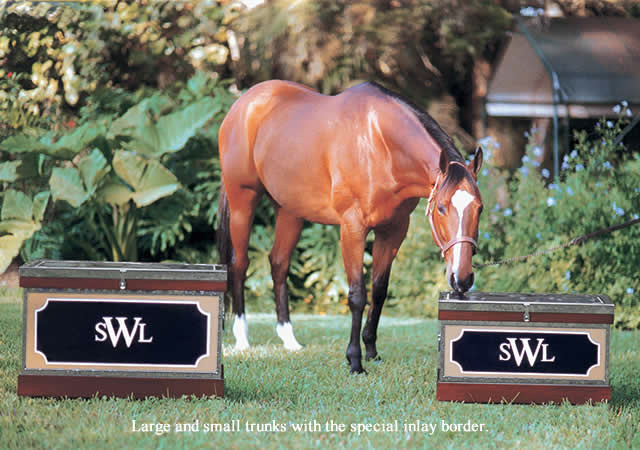 The Medium trunks are 34" long, 21" front to back, 20" tall. 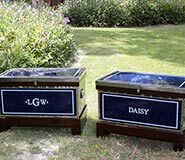 The Small Trunks are 32" long, 18" front to back and 18" tall. Colors have always been associated with sport horses, with military regiments, racing stables and hunt clubs. 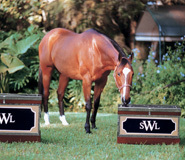 Colors make your horse equipment identifiable, uniform and organized. And having colors promotes a sense of belonging to a group, a stable where everyone works together. We make each item one at a time and the colors individually. They can be matched to paint chips from your hardware store, cooler or tack room drapes, farm sign, a picture in a magazine, a sweater you like or anything you choose to send us. Or you can simply tell us on the telephone which colors you want, and if either of us is uncertain as to the exact shade, we can send samples to you. 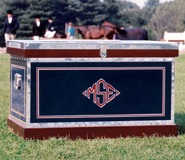 There are many design choices for your trunks and stable equipment. If you do not see anything you like, send us your ideas and we will try to work it out. 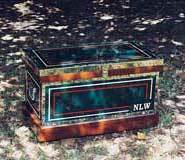 The two trunks in the first photo have the "special inlay" design, black in the middle with camel on the outside and a white ogee stripe. This is one of the ways to incorporate three colors. 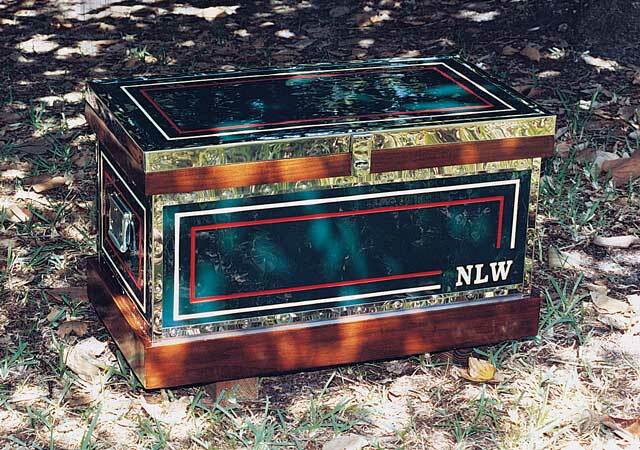 Following is a large trunk with the "triple stripe", red in the center piped or outlined in white, medium trunks also with the "triple stripe" and a small trunk with two separate different color stripes. We also divide one stripe in half making each half a different color. And, of course, the stripe can be of one color and the artwork another. These stained and varnished pieces are trimmed in solid brass with your choice of the bar or fold down handles. Included is a very heavy brass nameplate, hand engraved in the old deep engraving style. 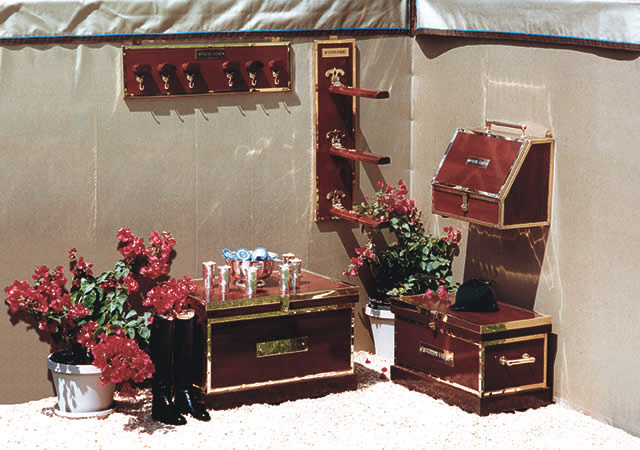 These trunks represent a very classic traditional solution to tack storage. All the pieces we make can be made in wood trimmed in brass.